Our main area of service is Auckland, Waikato, Tauranga, Wellington, Christchurch, and Dunedin. We also offer onsite computer repair and support on the Kapiti Coast and in Taranaki – if your location isn't listed, our friendly, NZ-based Geek Hotline team can help over the phone! You'll receive advice from a team you can trust, and computer assistance when you need it the most – so Book a Geek today on 0800 424 335 and receive the IT support you've come to expect from the team helping Kiwis with their computer issues for over a decade! Time to get a Geek in. We can help with all your IT needs including PC and Apple Mac systems, smartphones, tablets, and smart TVs. Call our friendly team on 0800 4 A GEEK, or fill out a Book a Geek form online to arrange an appointment. For your convenience, we come to you at your home or business. We have appointments available in the evenings and weekends. Our technicians combine computer expertise with great personality. They explain things without using technobabble and get everything working again. Easy! For more than a decade, our team has helped New Zealanders with laptop repair problems. If you need help setting up a device for your home or office, the Geeks on Wheels team is only a call away! We are confident we can handle almost any computer or technology issue and can assure our customers that no problem is too simple or complex for our technicians. Here are just a few of our common services that we assist with on a daily basis. Whether it is a smartphone, unresponsive hard drive, a simple email issue or completely broken PC – the Geeks on Wheels team are easily contactable. Do you need help securing your personal data, or do you worry that your hard drive contains a dangerous piece of ransomware? Geeks on Wheels can take on any data recovery task – let us handle your IT problems so that you can rest easy. Our team have years of experience in all areas of network and computer security. If you need assistance in your home or business setting up a computer, network, or Wi-Fi router, book a Geek today! Whether you have an unresponsive PC or a broken laptop screen, Geeks on Wheels can solve your computer repair problem today. Need to set up your email account? Stay connected with the world and let Geeks on Wheels set up your email for you. Having trouble with your home Wi-Fi? Don’t get frustrated over a dropped connection, Geeks on Wheels can fix it today. A slow computer can be frustrating – our team can be easily improve your computer through servicing or affordable part upgrades. Back up your data! Photos, music, emails, contacts, or business files are important, and our team can ensure you keep them safe. Is your computer running really slow all of a sudden? You might have a virus – call Geeks on Wheels for quick malware removal. Need help setting up a smartphone, laptop, or PC? Geeks on Wheels can set up your device and teach you to use it in the process. Have a computer problem but don’t know who to call? Our Geek Hotline Subscription is available for homes and businesses. 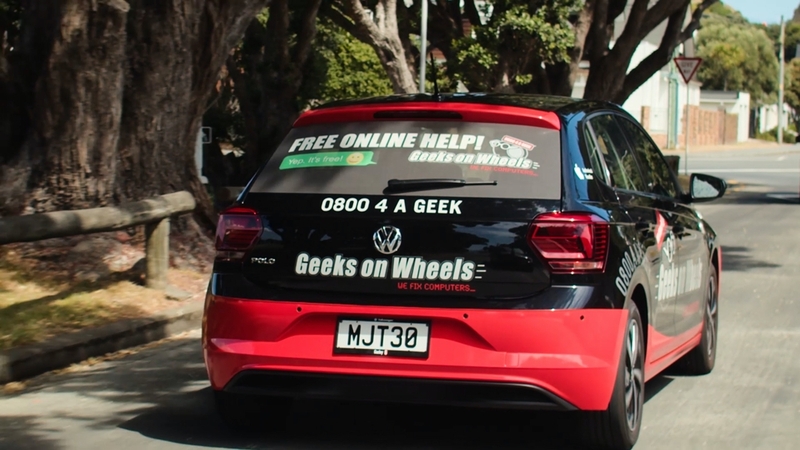 If you need computer help in New Zealand, Geeks on Wheels are the ultimate IT support team, available wherever you are! Whether you need a computer repair expert or IT advice on how to handle Wi-Fi connectivity problems, the team at Geeks on Wheels can come to you at your home or business. We fix Windows, Apple, Android devices and more. Money well spent! I am back in touch with the world, I would not have been able to do it myself! An excellent experience! Follow up and advice from office about change in arrival time both welcome and helpful. Dave J was cheerful and nothing was too much trouble - despite his having to work late!! He was also exceptionally capable and thorough. I wouldn't hesitate to recommend Geeks to anyone and will certainly use the service again. Just used your service for the first time- really impressed. The tech David was knowledgeable, explained everything well, was very easy to interact with, had excellent customer service skills, and easy to be around. Would definitely use again and recommend to others. Geeks on Wheels are absolutely fantastic! Right from the friendly operator who answered my call to the amazing technician that arrived at my door, I would most definitely recommend Geeks to all. Friendly, efficient and professional service from both Terry & the team at Geeks on Wheels. Thanks so much guys. I cannot speak highly enough of Sam's huge expertise, his helpfulness in explaining things, his willingness to carry out what ever task to make computer life easier for me. 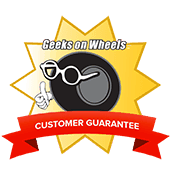 I have huge praise for 'Geeks on Wheels' in general, right from the initial phone call to book an appointment. Keep up the good work - I am spreading the word! Tech tip Tuesday! Did you know that a lot of NZ websites including the Warehouse, Trade Me and Geeks on Wheels have a logo like this at the bottom of their pages? Get our monthly newsletter and never miss a special deal.